WILLEMSTAD - The Venezuelan aviation company Aserca Airlines ceases all flights after 25 years. The economic climate in the South American country is so bad that more and more carriers are giving up. In a comprehensive statement on the website, management announced this news with pain in the heart. 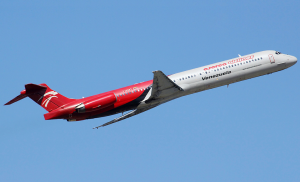 With a fleet of McDonnell Douglas MD-80s, a modest network was maintained to a number of domestic destinations and to Aruba, Curaçao and the Dominican Republic. Aserca continues to be active with the provision of maintenance services to third parties.